How can my knee be so unstable after 2x ACL reconstructions? I ruptured my ACL whilst skiing in Jan 07. 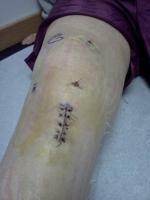 I had it reconstructed with a hamstring graft in June 07 (germany). After starting an intense rehab course in the Oct things went wrong- but for no obvious reason and knee totally unstable again (could push tibia back and forth to a great degree whilst extended). I had an mri that confirmed a tear in the meniscus, with ACL intact. In Mar 08 a surgeon in the UK said the graft was too vertical and i needed an ACL Revision op to correct it and hopefully the movement, as well as repairing the meniscus. This was done with an allograft in late May 08. It never corrected the tibial shift, and still pain in medial meniscus. MRI confirmed in Aug 08 yet again that i have a tear in both medial and lateral sides of the (medial) posterior horn. Is this due to the abnormal movement??? The surgeons' registrar (in July 08) put the movement down to fluid behind the knee. obviously talking rubbish! I am a keen to stay in the army, but the doctors and physios are completely baffled. This has been going on way too long and i'm going to lose my career if it stays like this.